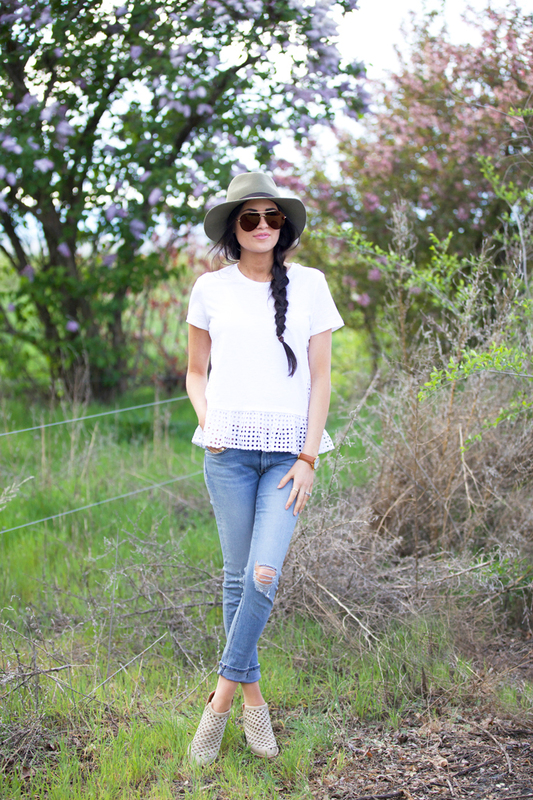 A simple, cute and casual look I wore on day two of our road trip to see the tulip festival in Washington! Have a wonderful weekend!!! Looking absolutely fantastic in this simple, comfy and casual outfit! I like your top very much! Super cute look! I just ordered those booties and I can’t wait for them to come in. Oh you will love them!!! Such a cute simple outfit! Love the details! That top is SO pretty…LOVE this casual look on you! Cute outfit! Love the peplum top. Thanks Amber!!! So sorry, which email address did you email? I will go look for it! One of my absolute favorite outfits!! So obsessed with this casual look! The braid with that hat is super laid back! Love that cute peplum top! Such a great casual look, Rach! LOVE this tee (and really your entire look)! Sometimes simple and basic is the best kind of outfit! Rach, I’m googling trying to find your new shop with your spring line. I don’t see a place linking to it on your site and I can’t find it with google – am I missing it? Thanks! I’m obsessed with these kind of, casual looks! The top is perfect and you look beautiful! Hi Rach, I just love your casual look for today….its spot on!! Actually I love everything you wear, and look forward to checking your site every day just to see what gorgeous outfit you will be wearing. Can you please tell me the color of the Jeffrey Campbell Booties you are wearing? I just love them and want to purchase a neutral color. PS….All my best wishes with your new clothing line and especially with your pregnancy! That”s awesome! CONGRATS!! You make clothes look so effortlessly chic! Love this look. In Mt Vernon??? I went to the festival there a few weeks ago. You look so glam for a road trip! I love this look. Where can I find the sunglasses? Are they discontinued? I’d love to get a pair like it but I didn’t see a link to it. Would you mind sharing?! Thanks so much!! Nice casual look! Love your shirt! Check out my Mother’s Day gift guide! Check out my Mother’s Day gift guide if you’re still looking for ideas! The hat is really nice. This is so cute, that tee is adorable and I need those booties! Love this look! I have been searching for a hat like that, love it! I love this top – so cute!! Love your casual outfit, it’s super cute! Sometimes the most simple looks are the best. you look so beautiful! The jeans are perfect! I love this top! Such a cute weekend look. I’ve also been meaning to congratulate you on your new line, it very “Rach Parcell”, and I want every single piece! Love love love this look! Such a cute & casual look! I will definitely be purchasing this top! This is such a cute spring look! I am obsessed with those booties!! Love the outfit! Your shirt and shoes match perfectly! Such a great look. Fashionably casual and comfortable! Love it! Such a cute eyelet white top.